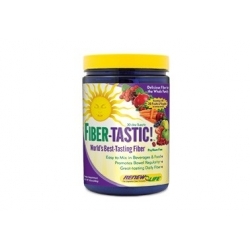 Fiber-Tastic! is a delicious daily fiber supplement for the entire family sourced from more than 20 fruits and vegetables, including raspberries, pomegranates, strawberries, carrots and more. It's loaded with health-promoting antioxidants and beneficial phytonutrients to aid bowel regularity and detoxification without gas & bloating.